$360.00 Order of Mother-Heroine, Var. 1, #17323, circa late 1940s. Features mint mark in very small font and hand-engraved serial number. A very attractive early example in excellent condition. $625.00 Order of Mother-Heroine, Variation 2, #83336, with both award two documents (Heroine's ID and "Large Certificate") and original case of issue for the Large Certificate, awarded in July 1965. Both documents have a facsimile signature of Anastas Mikoyan, who was the Chairman of the Presidium of the Supreme Soviet for a short period in 1964-65. A superb set in outstanding condition. $60.00 Large certificate for the title of Mother-Heroine, June 1981 issue in excellent condition. Shows autopen signature of Soviet premier Leonid Brezhnev. $190.00 Order of Maternal Glory 1st cl., Var. 1, #29914, circa mid-1940s. Scarce early version featuring wider pendant and counter-relief to the suspension device. Note the low 5-digit serial number. In fine to very fine condition. $65.00 Order of Maternal Glory 1st cl., Var. 2, #549161, circa 1970s. In excellent condition - a beautiful example free of noticeable flaking or scratches to enamel. $50.00 Order of Maternal Glory 2nd cl., Var. 2, #1603281, circa 1980s. A superb example with perfect enamel and details. $160.00 Order of Maternal Glory 3rd cl, Var. 1, #2175. An extremely early issue without mint mark and with relief reverse suspension device, almost certainly issued during WW2. In fine to very fine overall condition. $25.00 Order of Maternal Glory 3rd class, Var. 2, #1754556, circa mid to late-1980s. In superb condition; the enamel is completely free of the usual chips or flaking. $25.00 Motherhood Medal 1st cl., circa 1970s-1980s issue. In near mint condition. $10.00 Motherhood Medal 2nd cl, 1950s-80s, excellent, unissued condition in original named box of issue from the Soviet Mint. $9.00 Motherhood Medal 2nd cl, 1950s-80s. Excellent condition. 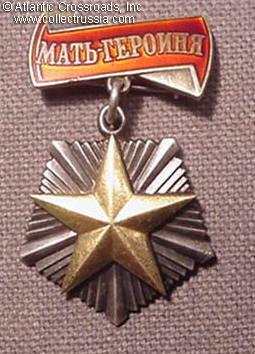 $20.00 Award certificate for a Motherhood Medal, 2nd cl., issued in 1953 to a Ukrainian. In near mint condition.